Tiffany Burich has over 10 years experience in the Fitness & Nutrition Industry. She is a Vegan Figure Competitor, Vegan Athlete, Fitness Model, an ACE certified personal trainer, has a B.S. in Exercise Science and a B.S. in Biology/Pre-Med. I saw an article about a “downer cow” and was immediately mortified and surprised that a human being could do something like this. I immediately cut out red meat and pork, and then continued to do research on factory farming and the meat industry. I was a biology/pre-med student at the time but had already been “cruelty free” as far as purchasing products: cleaners, make up, etc. I’ve been vegan since 2008. I really wanted to stick with it so the year before that I cut out a different group of meat every two months, ending with giving up dairy and all animal by-products. A lot! Long term: I haven’t been sick in 5 years, my endurance and recovery time in the gym is better, and I recently rehabilitated myself from a torn meniscus (when the doctors were saying surgery) through vegan supplements and my own Exercise Science knowledge. Short term: I tried eating chicken again about two months after I cut it out of my diet (as an experiment) and I immediately felt what I can only describe as “toxic”. Physically, I felt sick but more importantly, my mood was definitely changed. I just “feel better” all around as a vegan. Veganism means many different things to me (positive & negative). People can advocate veganism because 1. They have experienced the benefits 2. They want to stop suffering and cruelty to animals and 3. They want to save humans from disease. I am motivated by all three! The negative (for me) is just staying hopeful and not letting the images I’ve seen affect me by haunting me to the point of emotional imbalance. I am driven by the sadness of what I can’t currently fix but I’m able to control it to deliver the whole message in an effective and educational way. A mixture of Steady State Cardio, High-intensity interval training (HIIT), Traditional Weight training, Crossfit, Metabolic Training, Running. 5-6 days a week, sometimes two workouts a day - depending on what my goals are. Yes, I have been a trainer for ten years and offer personal training, online training, nutritional coaching and crossfit coaching. I am figure competitor in bodybuilding, weight lifting, running (marathons), crossfit and tennis. That our diets are boring, we don’t get enough protein, and are weak or feeble. I compete in endurance competitions and bodybuilding, I get people coming up to me all the time in the gym to compliment my physique or training style and they are always shocked when I say I’m a Vegan - love it! My endurance and my recovery time. I can do an hour on the stairs and then beat anyone’s time in heavy lifting or crossfit workouts right after. I’m also very competitive but I am working hard for those who do not have a voice or choice. To not over train and to take rest days. I also have to defend myself sometimes without seeming to be annoyed, talking about veganism is the ONLY time I can control my emotions actually. I know people are turned off and look at the extreme activists as just being “crazy” or “hippies.” While I feel just as passionate about veganism as they do, I have a knack for approaching people in a less extreme manner - plus I get asked about my physique a lot so that helps. Everyone has an opinion about veganism, regardless of what they do for a living. Fortunately forming the Plant Built Vegan Muscle Team this year has made a huge impression in the bodybuilding industry. Our group of 15 completely dominated the competition, multiple placings in every category, and even earned a few Pro-cards! No one in my family gives me a hard time, they can see I’m healthy and mostly just ask questions. “What do you eat?” “I could never give up (blank)”, “How do you get enough protein?” “Do you eat eggs? Fish?” Haha! I never really understood the miscommunication on that. I respond with a short answer and try VERY hard not to be irritated. The images of suffering and abused animals TATTOOED in my brain is what motivates me! 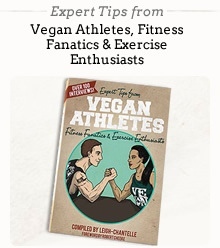 I definitely have some vegan athletes who I’ve looked up to and recently had the pleasure of meeting. Obviously everyone from my Plant Built Team; but to name a few: Robert Cheeke - who turned me onto Vegan Bodybuilding and was totally starstruck when I met him. Mindy Collette - who I also followed and is now one of my best friends, as we clicked immediately. Dani Taylor - who did my nutrition for my first competition and her fiancé Giacomo Marchese - who put this team together. Stephanie Rice, Sara Russert, Yolanda Presswood and Jaclyn Gough for their encouraging texts and messages on a daily basis; and Big Bald Mike from Bonebreaker Barbell - he’s been my rock & shoulder for sure! What do you eat for Breakfast, Lunch & Dinner - I cannot give specifics, as I am on a competition preperation from someone else, but in off-season I eat protein shakes in the morning (water, banana, strawberries, peanut butter, protein powder) and oatmeal. I eat protein bars/shakes and fruit as snacks (I love my bananas), Tofu with spinach or Kale salad for lunch or dinner, snack on hummus, veggies, walnuts, lentils with hot sauce. Snacks (healthy & not-so healthy) - unhealthy snacks are vegan chocolate chip pecan brownies, gardein chicken tenders with hot sauce, anything chocolate with peanut butter is my downfall. Gaining muscle – supersets, lifting heavy and eating carbohydrates. Don’t be afraid of carbs, you just gotta eat the right ones at the right time. I bring up veganism on social media by sharing stuff but also everytime I get a compliment on my physique or working out routine, I use it as an opportunity or when anyone brings up the subject of food.